• PSS-G2, 168 zones security paging station with dedicated MODBUS link for DIVA8 System, IDA4 System and IDA8 System. 1 pcs on Master Unit (g2). Max.1 unit per system. 1 pcs per IDA4xx Master and/or Slave unit. Max. 32 in a system. 4 pcs per IDA8C unit & 2 pcs per IDA8S unit. 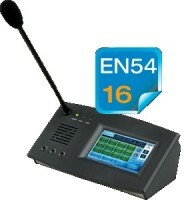 • PSS-G2/16, 16 zones security paging console for DIVA8 System. 1 pcs on Master unit (g2). Max. 1 unit in a system. • PSS-G2E, 168 zones NON-Security paging console with ETHERNET link for remote paging over TCP/IP for DIVA8 System and IDA8 System. Max.8 pcs over TCP/IP (g2).